Certain plant polyphenols not only exercise general positive health effects but also inhibit oncogenic transformation or the proliferation of cancer cells. Or, they outright kill cancer cells. 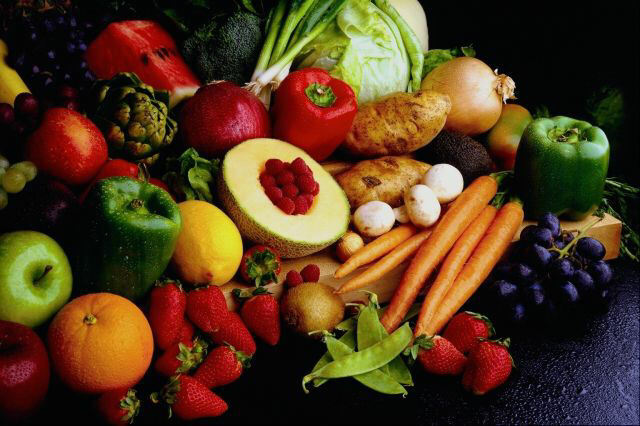 Included are a substantial number of cancer-fighting plant polyphenols, some of which are found in familiar substances like green tea, turmeric, ginger, garlic, broccoli and bitter melon. This blog entry is about the biological pathways and epigenetic transformations through which these cancer-fighting effects take place. I start with short descriptions of six semi-independent modes of epigenetic action through which certain polyphenols attack cancer cells – the six knockout punches delivered by these polyphenols. Then I cite a selection of research publications supporting this general picture and filling in the details. CFPs downregulate the expression of the pro-inflammatory intermediary NF-kappaB. Cancer cells proliferate most readily in a pro-inflammatory environment and find anti-inflammatory environments hostile. In normal cells, the stress generated by normal dietary intake of CFPs is within the hormetic range of response. Nrf2 translocates into the nucleus, ARE genes are activated including anti-oxidant and Phase 2 detoxifying genes. The net result is health-producing for the cell. The same is true when the stress is due to normal doses of CFP supplements. In cancer cells which are relatively deregulated to start with, the stress generated by CFP intake can be beyond the hormetic range, with the result being damage or death to the cancer cell. Third knockout punch mechanism – HDAC inhibition which re-activates tumor suppressor genes. CFPs act as HDAC inhibitors or HATs (histone deacetylase inhibitors or histone acetyl transferases). Expression of protective pro-apoptotic genes like P53 and P21 is turned on in acetylated cancer cells while it is usually turned off in deacetylated cancer cells. So, sensing self-damage, acetylated cancer cells are more likely to terminate themselves via apoptotic death. For the same reasons related to both non-hormetic oxidative stress and histone acetylation, cancer cells in an acetylated state are more likely to experience damage to their DNA repair machinery. Sixth knockout punch mechanism – – CFPs inhibit DNA methyltransferases (DNMT) in cancer cells, thus blocking the methylation and inactivation of tumor suppressor genes in cancers. These mechanisms are further elucidated in the research publications cited below. What are the major CFPs? Regarding expression of NF-kappaB: From my Treatise: “An important line of epigenomic research relates to NF-kappaB signaling. NF-kappaB is a nuclear transcription factor involved in cell signaling, i.e. a protein that binds to a specific sequence of DNA. It is present in a latent (non-activated) form in many cell types. On the one hand, expression of NF-kB appears to be one of the body’s regulatory means for handling situations of stress, cancer, damage or disease. In eukaryotic cells NF-kB is an important regulator of genes that control cell proliferation and cell survival. NF-kB regulates anti-apoptotic genes that protect healthy cells from cell death and activates the expression of genes that keep cells proliferating. On the other hand, activated NF-kB binding to genes has long been known to play a central role in promoting runaway inflammation and inflammation’s negative consequences. — These consequences include promotion of angiogenesis, proliferation, metastasis and invasiveness in cancer tumors, autoimmune diseases, neurodegenerative diseases and contributing to the activation of human immunodeficiency virus (HIV) leading to AIDS. — There appears to be increasing evidence that inhibition of expression of NF-kB could be a key approach for fighting cancers, controlling inflammatory diseases, AIDS, neurodegenerative conditions like Parkinson’s Disease and a number of other significant age-related maladies. — Recent studies position NF-kB even more centrally with respect to longevity. It is likely that NF-kB expression is central to a programmed set of changes which we call aging. One study(ref1) confirms that that in multiple mammalian tissues (including skin fibroblasts, kidney, cortex, kidney medulla, abdominal muscle, skeletal muscle, and brain), aging involves continuing changes in expression of hundreds of genes. And, further, NF-kB signaling appears to be a major regulator of gene expression related to the aging progress. In fact, by inhibiting NF-kB cell signaling the researchers were able to cause the epidermal tissue of old mice to revert to the state of very young mouse tissue, both in observable characteristics and in genetic expression profile. The authors show that NF-kB cell signaling is a meta-factor for determining aging of nine other key cell types as well, and they argue that the results should apply equally to humans and other mammals.” The relationship of NF-kappaB expression to oncogenic processes. cancer proliferation and metastasis runs deep and wide. See for example The activated NF-kappaB-Snail-RKIP circuitry in cancer regulates both the metastatic cascade and resistance to apoptosis by cytotoxic drugs. Regarding CFPs and the expression on NF-kappaB: Discussion in my treatise as well as many blog entries point to how CFPs inhibit the expression of NF-kappaB. Together, points a. – d. above characterize the first mechanism through which CFPs combat cancers: CFPs downregulate the expression of the pro-inflammatory intermediary NF-kappaB. Cancer cells proliferate most readily in a pro-inflammatory environment and find anti-inflammatory environments hostile. In normal cells, the stress associated with CFP intake is within the hormetic range of response, Nrf2 translocates into the nucleus, ARE genes are activated including anti-oxidant and Phase 2 detoxifying genes. The net result is health-producing for the cell. See the blog entries Nrf2: Part 1 – a new view on the control of oxidative damage and generation of hormetic effects. The pivotal role of Nrf2. Part 3 – Part 3 – Is promotion of Nrf2 expression a viable strategy for human human healthspan and lifespan extension?, and Part 2 – foods, phyto-substances and other substances that turn on Nrf2. However, in cancer cells which are relatively deregulated to start with, the stress created by ingestion of CFPs can be beyond the hormetic range, with the result being damage or death to the cancer cell. See the blog entries Mitohormesis and Radiation Hormesis for discussion of hormetic range. For example, for human head and neck squamous cell carcinoma cells, DNA damage has been shown to be caused by resveratrol(ref). Grape seed extract likewise causes DNA damage to squamous cell carcinoma cells (ref). Grape seed extract leads to apoptotic death of human prostate carcinoma DU145 cells via caspases activation accompanied by dissipation of mitochondrial membrane potential and cytochrome c release(ref). Sulphoraphane, a naturally occurring isothiocyanate induces apoptosis in breast cancer cells by targeting heat shock proteins(ref). Histone deacetylase inhibition (HDACi) is an important emerging approach to cancer therapy. There are at least two mechanisms through which HDAC inhibitors fight cancers: 1. turning on pro-apoptotic tumor suppresssor genes like P53 and P21 in cancer cells and 2. downregulates the cancer cell’s DNA repair machinery. It has long been known that histone deacytlases negatively regulate tumor suppressor genes thus promoting carcinogenesis(ref). Similarly HDAC inhibitors can cause re-expression of tumor suppressor genes like P53 which are turned off in cancer cells. 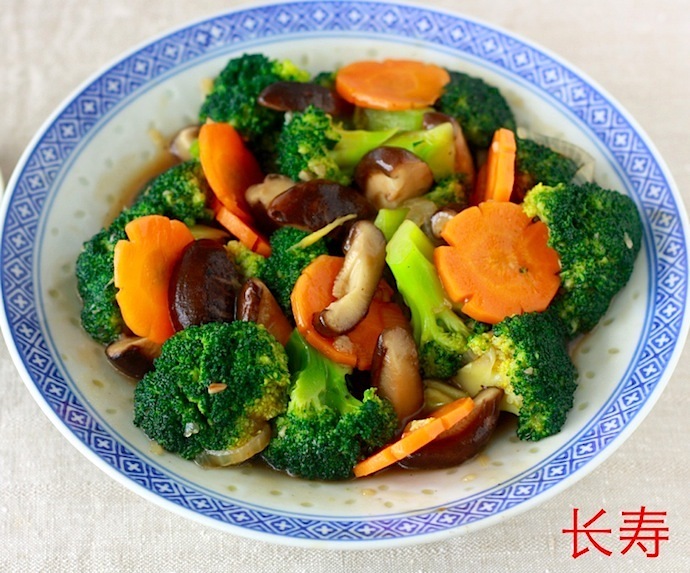 For example, benzyl isothiocyanate (BITC), a constituent of edible cruciferous vegetables, decreases viability of cancer cells by causing apoptosis. Its mode of operation appears to involve upregulation of P53(ref), likely to be due to HDAC inhibitory activity. The 2010 publication Downregulation of Homologous Recombination DNA Repair Genes by HDAC Inhibition in Prostate Cancer Is Mediated through the E2F1 Transcription Factor discusses the second mechanism in the case of prostate cancer: “Background Histone deacetylase inhibitors (HDACis) re-express silenced tumor suppressor genes and are currently undergoing clinical trials. Although HDACis have been known to induce gene expression, an equal number of genes are downregulated upon HDAC inhibition. The mechanism behind this downregulation remains unclear. Here we provide evidence that several DNA repair genes are downregulated by HDAC inhibition and provide a mechanism involving the E2F1 transcription factor in the process. Methodology/Principal Findings Applying Analysis of Functional Annotation (AFA) on microarray data of prostate cancer cells treated with HDACis, we found a number of genes of the DNA damage response and repair pathways are downregulated by HDACis. AFA revealed enrichment of homologous recombination (HR) DNA repair genes of the BRCA1 pathway, as well as genes regulated by the E2F1 transcription factor. Prostate cancer cells demonstrated a decreased DNA repair capacity and an increased sensitization to chemical- and radio-DNA damaging agents upon HDAC inhibition. Recruitment of key HR repair proteins to the site of DNA damage, as well as HR repair capacity was compromised upon HDACi treatment. Based on our AFA data, we hypothesized that the E2F transcription factors may play a role in the downregulation of key repair genes upon HDAC inhibition in prostate cancer cells. ChIP analysis and luciferase assays reveal that the downregulation of key repair genes is mediated through decreased recruitment of the E2F1 transcription factor and not through active repression by repressive E2Fs. Conclusions/Significance Our study indicates that several genes in the DNA repair pathway are affected upon HDAC inhibition. Downregulation of the repair genes is on account of a decrease in amount and promoter recruitment of the E2F1 transcription factor. Since HDAC inhibition affects several pathways that could potentially have an impact on DNA repair, compromised DNA repair upon HDAC inhibition could also be attributed to several other pathways besides the ones investigated in this study. However, our study does provide insights into the mechanism that governs downregulation of HR DNA repair genes upon HDAC inhibition, which can lead to rationale usage of HDACis in the clinics. Very specifically, CFPs can inhibit cancers via damage to their DNA repair machinery inflicted due to the HDAC activity of the polyphenols. In the last few years there has been increasing focus on the roles of mRNAs in epigenetic regulation(ref)(ref) The operation of this knockout punch is illustrated in this diagram. “Effect of dietary polyphenols on microRNA (miRNA) expression — miRNA are transcribed in the nucleus into primary miRNA (pri-miRNA) which is further cleaved by Drosha into precursor miRNA (pre-miRNA). Pre-miRNA is exported from nucleus to the cytoplasm and further processed by Dicer into miRNA duplex. Single strand of miRNA duplex (also called mature miRNA) leads this complex to mRNA cleavage or translation repression, which is dependent on miRNA:mRNA complementarity. 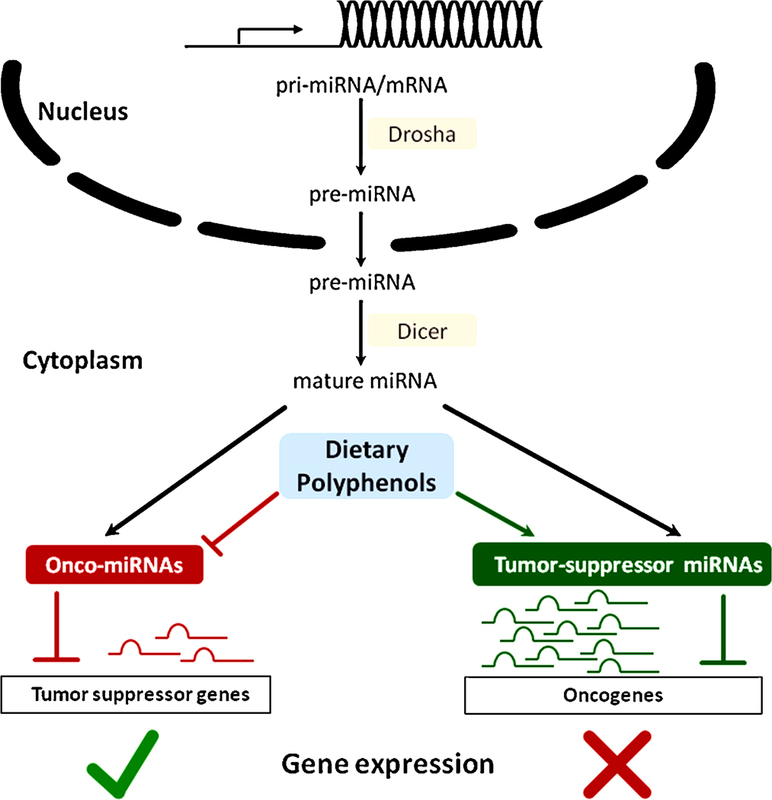 Dependent on various factors, miRNA can have either an oncogenic role (called onco-miRNAs) if the target mRNA is a tumor suppressor gene, or a tumor suppressive role (tumor-suppressor miRNAs) if the target molecule is an oncogene. 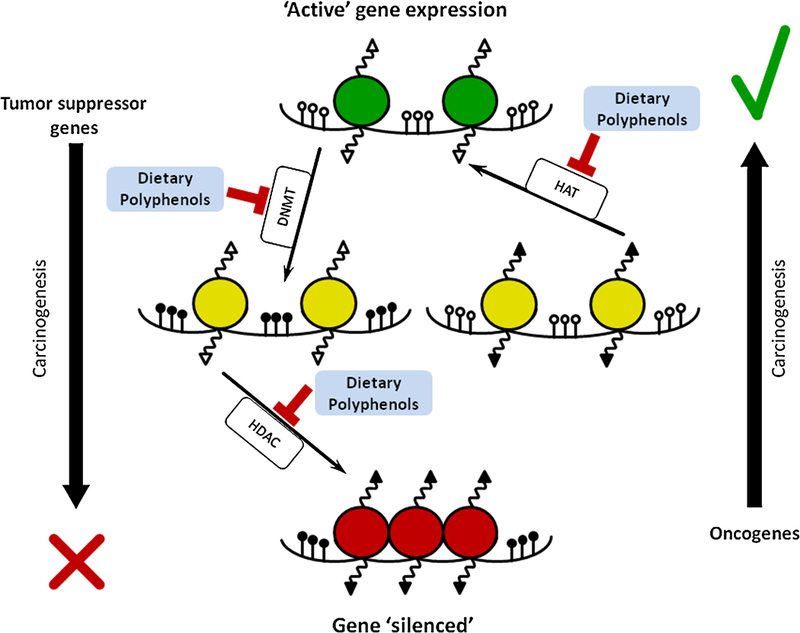 Dietary polyphenols can impact expression level of miRNAs and participate in gene expression regulation(ref)”. Finally, the sixth knockout punch – CFPs inhibit DNA methyltransferases (DNMT) in cancer cells, thus blocking the methylation and inactivation of tumor suppressor genes in cancers. DNA methylation also plays a major role in the epigenetic regulation of cancer processes. For example, tumor-protective genes like P53 become methylated in cancers resulting in loss of gene expression. “DNA methylation of genes in most human cancers is now believed to be a most frequent mechanism for the transcriptional silencing of tumor suppressor genes (23). Several detailed and informative reviews on the association between DNA methylation and cancer are available, but these are beyond the scope of this review (11;19;24–27). (ref).” There is evidence that CFPs may reverse such methylation. See the 2009 blog entry DNA demethylation – a new way of coming at cancers. A number of other publications support the hypothesis that CFPs inhibit DNA methyltransferases. See this list. As invariably so when it comes to cellular processes, there is interaction among the pathways involved in the various knockout punches. Specifically, it is not clear how independently HDAC inhibition and DNA methyltransferase inhibition operate. It appears that histone deacetylation inhibition can lead to demethylation and unsilancing of the same tumor suppressor genes. Therefore I have decided to frame the discussion of anti-cancer knockout blows primarily in terms of histones and HDAC inhibition, recognizing that there is another layer of complexity involving gene promoter methylation. 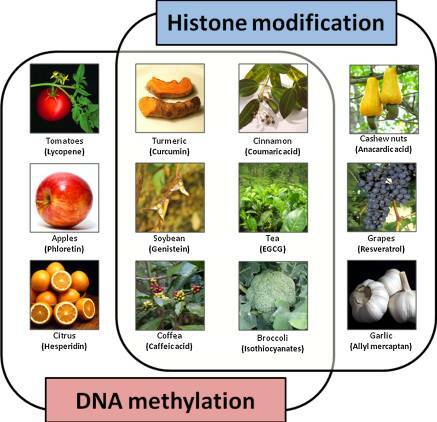 Although some CFPs affect both methylation and histone acetylation, not all do so. There is some literature suggesting that combining DNA methyltransferase inhibitors with HDAC inhibitors might make for more effective cancer tharapies(ref)(ref). The area of DNA methylation is complex, and that is one reason why I avoid delving further into it here. And I have also not discussed how CFPs may operate via non-coding miRNAs to regulate gene expression. It could well be that examining mechanisms more deeply a seventh or even more knockout punches against cancers could be identified. Why are CFP plant polyphenols so active against cancers? Of all the many classes of chemical compounds, why are CFPs so singled out for their anti-cancer activities? In one of our phone conversations, James P Watson suggested an excellent answer based on tens of millions of years of plant evolution. Unlike animals, plants only rarely get cancers. Think of them as ancient living laboratories, constantly evolving and creating new defenses to further their survival and propagation. These defenses include protection against all kind of threats and stresses including extremes of temperature and humidity, seasonal changes, attacks of insects, bacteria, mold and fungi, and cancers of all kinds. The defenses include the creation of signaling molecules that trigger responses to such stresses. The CFPs are among those molecules. They were evolved to fulfill highly specific purposes – cancer protection among them. Because we humans share so many biological pathways with our plant cousins, the CFPs fortunately work to some extent for us as well. As a thought flight, think of it this way. Throughout the world there are dozens or even hundreds of gleaming glass buildings full of white-coated scientists working for drug companies or universities trying to discover drug treatments or cures for cancers. They have been screening millions of compounds looking for simple magic-bullet solutions. This kind of screening has been going on for some 40 years now, and for the effort put in we have generally not gotten far in eliminating cancer as a threat to humans. On the other hand, trillions of plants throughout the world, each an evolutionary laboratory have been working for tens or hundreds of millions of years and have pretty much solved the problem of cancer for plants. They did this by creating very complex compounds with multiple signal functioning, including the CFPs. The CFPs are very sophisticated substances. It is probably time now to shift our major cancer-fighting drug efforts from looking for kinases or other simple drug solutions to comprehending the actions of CFPs and adapting them to satisfy our health and longevity-creating intentions. Again, I point out that a social problem must be solved if we are going to do what I just suggested in a responsible manner. The business models of pharmaceutical companies requires that they traffic only in highly proprietary patented substances, and this excludes natural substances like the CFPs. Well and good that several pharma companies have started drug discovery processes by screening leading to a CFP, and then trying to find analogs that are more powerful or more directed to a specific disease processes. Such an analog could be patented, put through clinical trials and then sold as a proprietary drug. Many drugs have in fact been created that way. But what if a CFP is already highly optimized in its evolution-created form? Does it make sense for a drug company to create an analog at great expense that is no better but that is FDA legitimized as a drug, that this drug is promoted and adopted by mainline medicine and sells for 30 times the cost of the equally effective CFP? Probably not, but I am afraid that is what is likely to be happening. I discuss this issue more extensively in the recent blog entry Editorial -Bridging the Great Divide. What supplements/herbs do you recommend to take as anti aging? I am an 33 years old man. I put this list together in 2009 and it still looks pretty good to me. 2. A much more comprehensive list perhaps suitable for an old geeze like me in good health is in my treatise ANTI-AGING FIREWALLS – THE SCIENCE AND TECHNOLOGY OF LONGEVITY at http://www.vincegiuliano.name/Antiagingfirewalls.htm Look for the Table entitled TABLE I – SUPPLEMENTS IN COMBINED FIREWALLS.